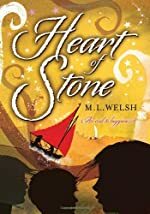 Heart of Stone by M. L. Welsh. The Sequel to Mistress of the Storm. Review: Do you like books that are suspenseful, mysterious, and thrilling? Then Heart of Stone by M.L. Welsh is the book for you. This book contains it all with the characters of Verity Gallant, Henry Twogood, and Martha Platt. The author creates the suspense that will grab the reader out of their seat. Mysteries are waiting to be uncovered and thrills are trapped in this book seeking a way out. This is the second book in a series; the first is Mistress of the Storm. Crystal clear waters, nature everywhere, and magic in the air creates the scene where it started, the old town of Wellow. Everyone thinks it's just another normal year at the town of Wellow, but what they don't know is the truth. There is a hidden enemy attacking the town, making sure no good will come out of this year. The only people who know what's happening is Verity Gallant and her friends, Henry, Martha, and the librarian. Will Verity and her friends be able to save Wellow from destruction? Unless the force is acted upon fast enough, there can be no good forever. The kids will have to go back to the beginning and locate the four keepers--- water, fire, wind, and Earth to save the town from total elimination. Along with the vivid and engaging setting, the characters and relatable and interesting. For example, Verity Gallant is the kind of person who is not self-centered when help is needed. She is in a competition and when a great conflict occurs, instead of trying to win, she helps the people who are in danger. Not only does Verity help the others, but her friends are pitching in too. In addition, she and her friends and her are have differences, but when it come to helping Wellow they worked together as a team. All the characters have mixed personalities which make them unique and interesting. This story is great for everyone it has thrills , action, mystery ....... it creates suspense because you never know what will be discovered next. A memorable quotes are, "It was a scene like a nightmareÓ and "We have to helpÓ The engaging words create suspense which makes sure the reader never wants to stop reading. I always wanted to know what would happen next . The Heart of Stone deserves 5 stars because I learned life is like a rollercoaster; you never know what comes next, so always be prepared. Review written by Jill (6th grade student). We would like to thank Random House for providing a copy of Heart of Stone for this review. Have you read Heart of Stone? How would you rate it?